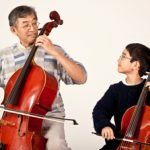 All accredited Suzuki teachers must pass entry requirements and undergo specialised training to teach the Suzuki Method. Once accredited, teachers are expected to participate in teacher training workshops to ensure their professional growth and maintain their teacher status. Teacher Accreditation levels are indicative of the current level of training and experience. Cert III level teachers have complied with all training requirements up to Graduation level 3 on their instrument. Cert IV have complied up to Graduation Level 7. Diploma have completed our full course.